Scooper Heroes to the rescue! Left – Right Andy Breen – Street Scene Action Team Ranger, students from Howard Park School, Cleckheaton and Jeff Boyes – Street Scene Action Team Ranger. Children from schools across Kirklees are helping clean up the streets and make Kirklees a safer place. The children are spending a day in their local area as scooper heroes – complete with capes and rosettes! As scooper heroes they will be handing out poo bags, and leaflets to help raise awareness and encourage dog owners to clear up after their pooches. The children, accompanied by the council’s street scene action team, together will be on the lookout for conscientious dog owners so that they can give them a raffle ticket and the chance to win a doggy hamper from Pets at Home. The hampers have been donated by the Dewsbury and Huddersfield stores and are worth £25 each. The heroes have been in action across Kirklees – have you seen them? 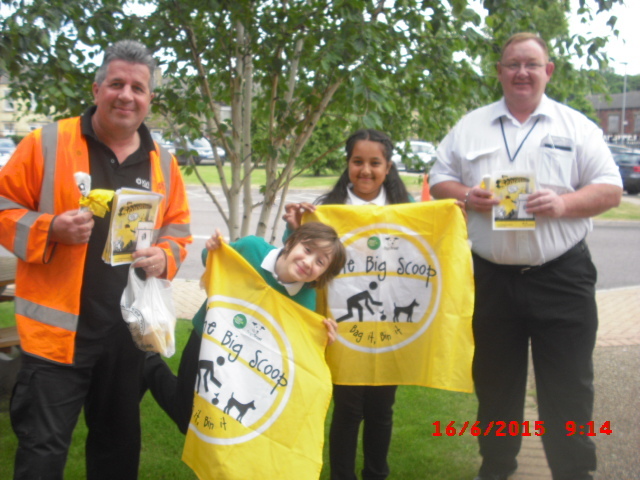 The big scoop is a national campaign run by the Dogs Trust and Keep Britain Tidy who have provided the materials including the capes and rosettes free of charge.